We understand that there are a lot of choices when buying your next new or used vehicle, financing your purchase, getting service performed, or buying parts for your vehicle. It’s a tough decision unless you’ve already had a history of great service from an automotive retailer. If you’re looking for an auto dealership that can serve your automotive needs, we want to provide you a list of reasons our customers tell us that they come to Suburban INFINITI of Troy. “Certified” INFINITI vehicles – INFINITI has trained Suburban INFINITI of Troy mechanics to inspect and repair our used INFINITI vehicles to bring them up to the stringent standards required to be classified as certified INFINITI cars. Professional, certified sales staff – INFINITI has certified our sales staff and the National Automotive Dealers Association has accredited our staff in the best communications practices and ethical treatment of customers. Easily accessed location – Located at 1816 Maplelawn Dr in Troy, we make it very easy to get to our facility. Accessing our location from I-75 or Big Beaver makes for an easy commute to our dealership. Free Wi-Fi – We provide free Wi-Fi access for all our customers to use all your electronic devices while you’re waiting for service to be performed. Family-owned business – The Fischer family has owned car dealerships since the 1950’s and Suburban INFINITI of Troy is proud to be part of the Suburban Collection of dealerships, all striving to maintain the same levels of superior customer satisfaction and service. You don’t want to deal with a mega-corporation that loses sight of the individual customer. On-site café – We have a very well-equipped café in our dealership that can make you wait for your auto repair a little easier. Whether it’s a snack, breakfast or lunch, we’ve got a nice selection of dishes to meet your needs. Delivery to your location – Our staff is happy to deliver your new or used vehicle, free of charge (distance limited, contact us) to your work, home or location of your choice. This is one of many things that our customers tell us that sets us apart. Professional, customer-focused management team – Our General Manager – Bart DeBrow and our Sales Manager – Chuck Taylor, along with Chris Lange our Service Manager and the rest of the management team are here to assist you and make sure your experience is nothing short of amazing! Suburban warranty on used cars – We offer our own warranty on many of the used cars we sell. It gives you an extra sense of security that you’re getting a vehicle that will perform well for a long time. Internet sales team – We have Internet sales staff to assist customers that prefer to do business over the Internet, or just can’t drive to the dealership to get questions answers. Our Internet staff specializes in online sales process and is equipped to answer all your questions. 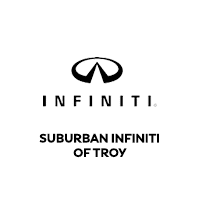 Troy‘s newest dealership – Suburban INFINITI of Troy has the most up-to-date facility in the area. Having been remodeled recently, the showroom, mechanics bays, tools, and customer waiting area all have the latest amenities and are designed with the industry’s best practices in mind. CarFax reports – We offer our used car customers access to CarFax reports to help them become more comfortable knowing more about the used car they are interested in. Over 1,700 used cars in stock – Being part of the Suburban Collection of dealers, our metro Detroit based dealership has plenty of used vehicles on-site and access to over 1,700 other vehicles in the metro Detroit area. When you’re shopping for used cars, selection is absolutely critical, and we know it. Customer rating of 4.4 out of five stars on DealerRater – We’re particularly proud of our 4.4 rating* at DealerRater – the premier automotive dealer rating service on the Internet. We have more than 100 customers* that have willingly spoke up on our behalf. DealerRater has over 700,000 reviews posted by people just like you, and gets over 850 new reviews every day! Experienced service department – Our mechanics have been trained to work specifically on INFINITI vehicles and have knowledge, background and hands-on experience like no other general mechanics in the area. Our ASE certified and factory trained technicians and service advisors can also provide a free multi-point vehicle inspection with every service! Loaner vehicles – Our service department can provide loaner vehicles should the situation call for it. Express Service – We offer Express Service, which gets your minor services done quickly, without an appointment! We have dedicated technicians to do tire balancing/rotations/replacements, batteries, engine air filters, and windshield wipers without waiting in line with the folks getting more involved services done. Alternative financing – Special financing arrangement can be made available for parts and service repairs. AAA-approved auto repair – Our store has been approved by AAA – recognizing our service as an excellent location to get your auto repair done. On-line service scheduling – Our recently re-designed website allows you to pick the date and time you would like the work to be done on your vehicle with our handy online form. Extended service hours – The service department opens early and works late to get your car in and out as quickly as possible. OEM INFINITI parts department – We typically stock all common INFINITI OEM parts and accessories made specifically for your vehicle – more than any other non-dealer auto repair facility. Vehicle pick-up and Delivery – We will pick your vehicle up, take it in for service and deliver it back to you.